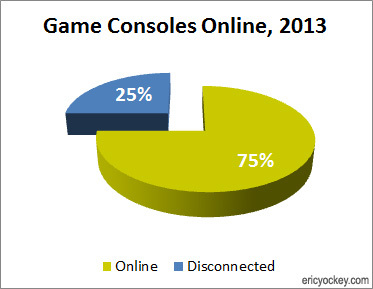 Nintendo’s new Wii-U console boasts an internet connectivity rate of 74%, while a 2010 study showed that 78% of PlayStation 3s and 73% of Xbox 360s are online. However, a 2012 survey from Frank N. Magid Associates (proprietary study) suggests that 47% of console gamers are unlikely to use their console’s online services, and another 37% are ambivalent to the concept. Further, the Xbox 360 requires a $100 adapter to connect to a wireless network, which means that most consumers have to run a lengthy ethernet cable from their modem to the living room. The point being: while it’s true that 3 in 4 consoles are online, most people have no desire to use online features in games. Is it therefore fair to expect consumers will tolerate paying for software that amounts to an open beta, especially when 1 in 4 customers will never have their games fixed, and the majority would rather not be burdened with the downsides of connectivity? And what of the impact to a company’s brand image? Many big game releases receive major backlash from the communities they intended to serve: One of Bethesda’s newest games, Skyrim, was plagued with slowdown issues that rendered the game nearly unplayable for many PS3 users (to say nothing of the many issues that were already present in the PC release–refer to the video below), and the issues persisted after three subsequent patches on the console. Some gamers also discovered that the patching process would corrupt their saved games, wasting dozens to hundreds of hours of their time and effort.